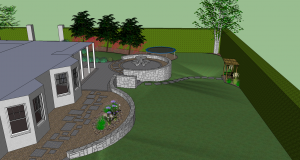 This garden design will transform a large neglected garden surrounding an old house outside Dublin which has just been redesigned and extended. The existing garden has been devastated from years of neglect and the recent works on the house. 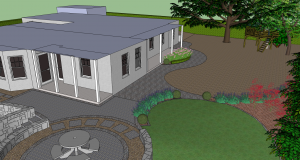 The garden will be transformed into an attractive compliment to the new house with soft curving lines wrapping around the house and garden incorporating areas for play, relaxation and dining. Natural stone and rock materials will be used which will add to the softening effect with muted greys and beige tones. Planting has been used to settle the house into its environment particularly at the entrance but overall it has been kept to a minimum and where possible planting in gravel areas is proposed to keep maintenance low. New gates, pillars and granite cobbles at the entrance into the garden will provide access to a gravel driveway and parking area which will soften the current straight lines of the house by curving around a new grey granite cobble path adjacent to the front façade of the house. A new planting border directly adjacent to the porch along a portion of the front façade of the house will assist in settling the house into its environment and soften the lines of the house. 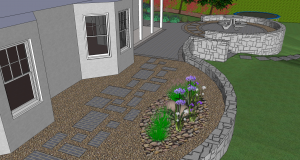 The path at the front of the house will connect to a new patio made from grey sandstone encircled by granite cobbles, set in the south east corner of the house to avail of the best position for dining and access to the kitchen. A raised circular patio also made from grey Indian sandstone and encircled by grey granite setts and gravel will connect to this patio at this corner. It is proposed to soften the surrounding gravel by planting alpine low growing plants adjacent to the base of the natural rock wall which will encircle the patio. This rock wall will be 400mm higher than the paving to allow it to double as a seat when required. A sloping lawn will wrap around the east and south sides of the garden with gradients which will link the driveway, house and all associated boundaries together as gently as possible. A shrub border will be created from the driveway along the east boundary encircling the existing trees in this area which will be under planted with Japanese maples providing wonderful autumn colour and spring flowering bulbs. The border will finish at a circle of gravel on a completely flat surface onto which the children’s trampoline will be placed. The lawn is designed mainly as a children’s play area, however, to add interest and break up the lawn whilst still allowing for play, steps will lead down from the patio curving around the outer wall of the circular patio, onto the lawn to a set of gently sweeping grey Indian sandstone stepping stones leading to a swing seat set adjacent to the hedge set in a planted gravel bed. Each corner of the south lawn will be finished in a semi-circular border to soften the corners. 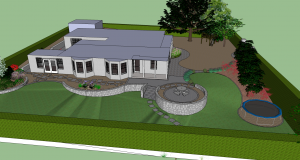 The patio will also connect to a gravel bed along the side of the house with an irregular stepping stone path leading to the end of the house and a lane to the rear courtyard. A water feature will be positioned along the outer side of this path which will be surrounded by larger beach cobbles blending into the gravel and softened by planting. 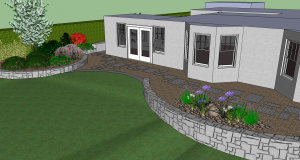 The outer side of the gravel bed will be finished in a low natural stone wall which will increase in height according the gradient on its outer side where it connects to the lawn. The gravel bed will finish at a semi-circular raised bed supported by a 300mm high matching natural stone wall. Due to the gradients of the lawn it will connect level onto the gravel bed at this end of the garden with a row of Indian sandstone slabs.